The PIC inquiry resumed on Monday with a forensic auditor denying that the anonymous person who accused former CEO Dan Matjila of benefiting a supposed girlfriend was a whistleblower. The investigator hired to find out who sent emails with allegations of impropriety against former Public Investment Corporation (PIC) CEO Dan Matjila and CFO Matshepo More, who is also the current acting CEO, on Monday dismissed claims the anonymous sender was a whistleblower. Naledi Advisory Services director Frans Lekubo was testifying at the PIC inquiry public hearings as they entered a second week. Lekubo’s firm was hired in 2017 by Matjila to investigate the identity of James Nogu, an alias used to email confidential information to employees and the board, including claims Matjila had improperly tried to benefit a woman Nogu claimed was the then-CEO’s girlfriend. An investigation by Advocate Geoff Budlender has since dismissed Nogu’s allegations of corruption against Matjila and said he had no romantic relationship with the woman, but former intelligence minister David Mahlobo had asked Matjila to assist her in getting PIC funding. Lekubo discovered that a criminal case of corruption was opened to investigate Matjila on the claims after the PIC’s head of IT security, Simphiwe Mayisela, went to the police. Mayisela had not informed the PIC of the case, did not explain whether he had a mandate to open a case and did not tell the PIC about further police enquiries. “While conducting the investigation to establish how the confidential PIC information was leaked and who would be responsible for leaking it, we came across information that there was a criminal case which was registered by a staff member against the CEO of the PIC and the investigation was ongoing,” said Lekubo. “Mr Mayisela appears to have made the decision to have registered the corruption case against Dr Matjila alone without any mandate from the PIC,” he said. Mayisela, hired weeks before the allegations against Matjila were distributed, later told PIC bosses the anonymous Nogu could not be traced as the internet service provider was a French company and could not be subpoenaed. It was actually a South African company. “It’s not clear whether Mr Mayisela was being deliberately deceitful or just misinformed,” Lekubo told the inquiry. Police dismissed attempts by the PIC to have police investigate Nogu’s identity. Lekubo said he could not uncover Nogu’s identity without the police issuing a subpoena to the internet service provider he used. “In my view, he was not a whistleblower,” said Lekubo on both the anonymous whistleblower and Mayisela. Reports suggest the allegations against Matjila, who resigned in November amidst claims that the R2-trillion asset manager was unstable, may have been intended to bring about his removal. Mayisela was dismissed after a disciplinary hearing while IT boss Voyokazi Menye, who was also accused of withholding information about the SAPS case, left after reportedly receiving a R7.5-million payout. Lekubo also said Mayisela may have falsified his academic qualifications, had accessed adult material on his work computer and intercepted Matjila’s emails without authority. The former IT security head said he accessed Matjila’s emails on Menye’s instruction. As the saga played out, an under-pressure Matjila also got permission from the board to access four-month’s worth of emails from six of his top executives in order to find out who had accused him of corruption. The inquiry on Monday also heard from a representative from the Association for Monitoring and Advocacy of Government Pensions (AMAGP), a non-profit aiming to ensure the PIC protects and grows the government employee pensions it manages. AMAGP’s Albert Van Driel questioned the PIC’s investment strategies. “Unfortunately, there is a very strong emphasis on things like doing developmental projects and often those developmental projects are not giving yields and some of them really crash within the first year or two and therefore that money is lost,” he said. He said the PIC should invest in broad-based black economic empowerment projects but only when they are likely to be profitable. He noted the investments in Independent Media and Ayo Technology Solutions, calling them “very, very poor investments for many reasons”. 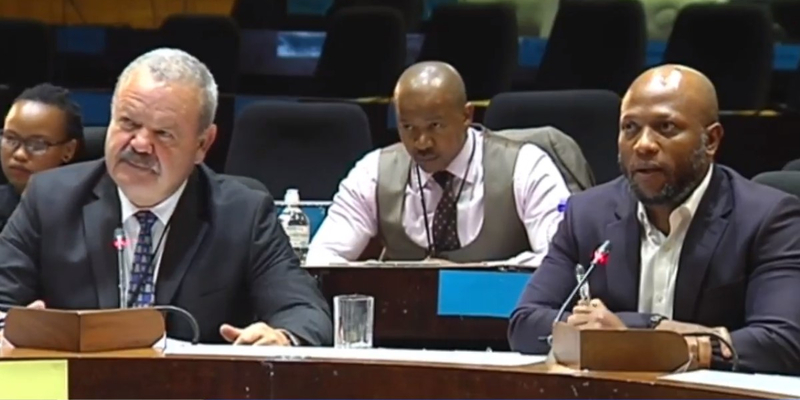 Both companies are linked to businessman Iqbal Survéand came under pressure during the first week of the inquiry, with commissioners hearing that the R4.5-billion investment in Ayo did not follow standard procedure. The inquiry on Monday also heard from PIC executive head of property Vuyani Hako, who questioned the organisation’s bonus scheme, which he said is creating unhappiness among employees. “I think the general feeling is that the determination of bonuses is not a fair process and I think the feeling is that the determination of bonuses could be more certain, could be more clearer,” he said. Hako said there’s a remuneration policy on bonuses “but the determination of bonuses does not necessarily follow that, according to me”.